January 22, 2019 | USA: Longmont CO | Source: CGRS, Inc. 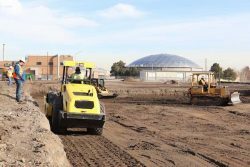 Driven by an age where sustainable resources are increasingly important, the City of Longmont has begun construction on its Biogas Treatment and Renewable Natural Gas (RNG) Fueling Station Project. Once complete, this innovative project will transform sewage gas from the wastewater-treatment process into sustainable fuel for the City’s trash trucks. The City will replace 11 of its diesel trash trucks with trucks capable of using RNG fuel. It is estimated that the City will offset over 100,000 gallons of diesel fuel annually, reducing greenhouse gas emissions by about 1,000 metric tons of carbon dioxide equivalents per year — the equivalent of removing 200 cars from the road. In addition, by building the RNG Fueling Station, the City is also able to take advantage of valuable credits from the United States Environmental Protection Agency’s Renewable Fuel Standard program. The City has contracted with Carollo Engineers, a top national design firm with local offices in Broomfield and Littleton, and CGRS, a Fort Collins-based environmental services and construction company, to design and construct the project. CGRS is serving as project manager and construction contractor for the project as well as designing the new fueling station; Carollo designed the biogas treatment system.